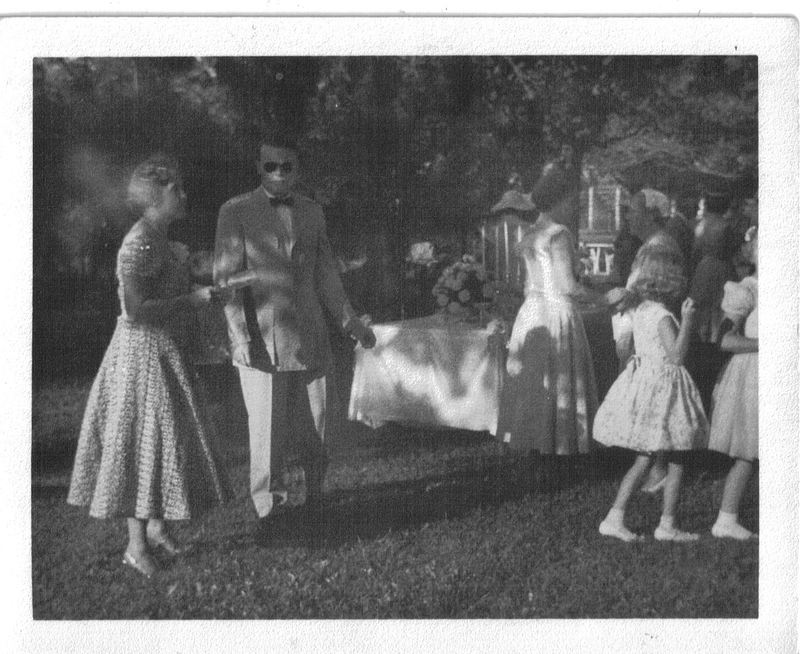 My mother only this week told me the story of when Truman Capote came to her seventh birthday party. He didn’t come to Arkansas where she grew up—not ever, that I know of. She was visiting cousins in Monroeville, Alabama, and, as the visit fell on her birthday, they threw her a party with the neighbor children in attendance. In a picture from that day my mother showed me, the girls are in frilly white dresses with anklet socks and sandals or patent-leather shoes. Mr. Capote is in the picture as well, speaking to my grandmother, who at that time of course was a pretty, still-young woman in a becoming dress. My mother’s first cousin Jenny was a poised and precocious child, which makes me wonder whether Truman Capote got his inspiration for “Children on Their Birthdays” from that party. He, too, must have been visiting cousins in Monroeville. Thankfully, unlike Miss Bobbitt in the story, no one was hit by the six o’clock bus that day, but something did happen, something my mother both knows and does not know. What she knows is that Mr. Capote said something extraordinary to her mother, and that she was never quite the same afterwards. What she does not know, because she never found the right moment to ask in the years before her mother died, is what he said, or why he was moved to say it. It seems possible to me that this black-and-white almost chiaroscuro photo was taken just as he was speaking to her and that it captured her psychic state. Her head seems light, fuzzy, almost immaterial, not a lack of focus or a flaw in the equipment but a true picture of how she felt. She is half-turned, in profile, while he is facing the camera, though with dark sunglasses that hide his eyes. He looks annoyed at the photographer or perhaps just at the glare of the afternoon light and the emptiness of his highball glass. My mother, Susanna, said that her mother, Lucy, had taken her down to Alabama on the train, a long journey and not direct, to get away from her father for a little while. “She would take these breaks periodically,” my mother told me, “when his goodness just got to be too much for her.” My grandfather—named Franklin, after FDR—was ever patient, kind, temperate, helpful, easygoing, understanding, and loving. For a woman of my grandmother’s temperament who needed to kick up her heels, kick off the traces, and in general just kick back every once in a while, his saintliness made her feel shallow and selfish, so when she felt a little evil coming on, she’d pack up a suitcase and take my mother to visit some cousins, of whom she had plenty, and she would smoke and drink and gossip and cackle until she got it out of her system and she could once again appreciate the many fine qualities of my grandfather. On the day she died, many years later, she uttered a cryptic statement that made my mother wonder further: “He was right—I wasn’t as bad as I thought I was. That was true.” Or “Tru.” Of course it wasn’t possible to know.